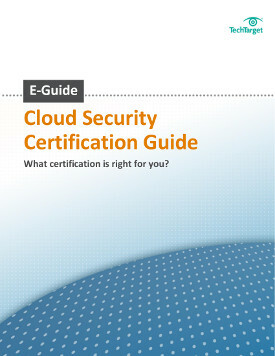 This exclusive guide examines the available cloud security certifications that can translate to better career opportunities -- and a higher salary -- for you as cloud security best practices and certifications continue to expand and mature. Thank you for participating in our survey. Not only do your responses help our editorial team create content that addresses both your current concerns and future plans, but your participation qualifies you for exclusive access to this expert guide as well. Only available to those who have taken the time to thoughtfully complete our survey, the editors of SearchCloudSecurity.com have created an exclusive guide that examines the available cloud security certifications that can translate to better career opportunities and better pay for you. Download this reference guide now to be sure you don't miss out on the invaluable advice it holds. Cloud looks very vulnerable in the perspective of Goverment Organization due to lack of cloud exposure as well as fear of unknown.